The TFTA’s ‘Golden Turkey’ Quality Assurance Guarantee sets the standard for the very finest quality Christmas turkeys. 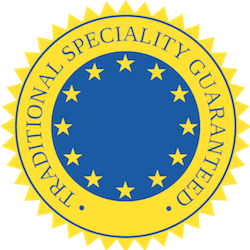 There’s also something quite unique about The Traditional Farm-fresh Turkey Association, they were the first product in the UK to gain recognition with a designation for ‘Traditional Speciality Guaranteed.’ This is quite an achievement when you understand the lengths that the EU legislation goes to in protecting food names on a geographical or traditional recipe basis. The purpose of the law is to protect the reputation of the regional foods and eliminate the unfair competition and misleading of consumers by non-genuine products which may be of inferior quality or of different flavour. Their system highlights regional and traditional food whose authenticity and origin can be guaranteed, wine and cheese were some of the first to benefit and The Traditional Farm-fresh Turkey Association are proud to display the TSG emblem – it sets them aside from other turkey producers -if you’re looking for the best birds, you need look no further. You won’t find these turkeys in your local supermarket, The Traditional Farm-fresh Turkey Association offer their turkeys at the farm gate, farm shops, quality butchers and online.